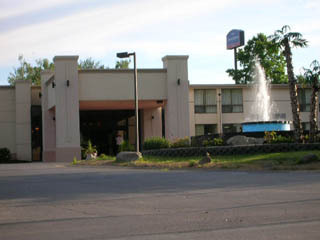 The Howard Johnson Hotel is centrally located in the heart of the Pocono Mountains. This Hotel is much more than you would expect for a Traditional Howard Johnsons. With Restaurant, upscale lobby, indoor pool, interior hallways and friendly service. This recently renovated hotel features deluxe accommodations and numerous amenities that will help make your stay a memorable one. There is an indoor pool, a small fitness center, and restaurant onsite. Camelback Ski area, Camelbeach waterpark and many other family attractions and restaurants are only minutes away. Take Rt84 east to Rt 209 south, stay on 209 south until you hit Rt 80 west follow 80 west to PA exit 302 at the light turn right, directly on the right hand side. Take Rt 83 north to Rt 81 north,follow Rt 78 east,from Rt 78 east get on RT 22 east to 33 North, follow to the end at the light make a right we are directly on the right hand side. Take Rt 80 east to PA exit 302B at the light make a right, we are directly on the right hand side. Take Rt 80 to PA exit 302 at the light make a right we are directly on the right side.